Alecia Moore is not only famous for being the one and only punk rock singing, generation leading "Pink" but she is also a dedicated activist in search of equality and rights for all humans and animals alike. Although Alecia Moore started out as a back-up singer, followed by being a member of a female R&B group, her new home as the voice (or unvoice) of a generation has certainly grown on her and she has shown that no matter what or who tries to stand in her way, this flaming Pink chick is not going anywhere anytime soon. In 1999, Alecia Moore received her big break when her role as the member of a low-key R&B women's group didn't work out, and she signed her solo career with LaFace Records. 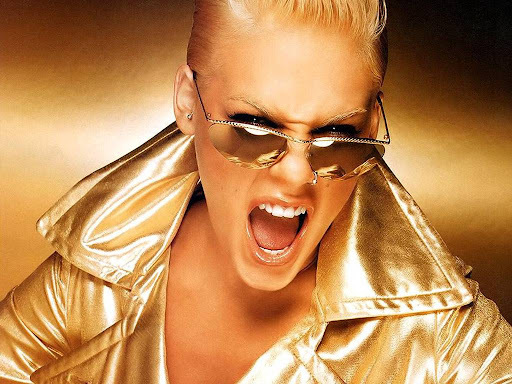 In spring 2000, Alecia, under the pseudonym "Pink" released her debut album to worldwide acclaim and fame. Her debut album, "Can't Take Me Home" included her Top 10, Gold Single "There You Go"-which was named the Number 2 Breakup Song of All Time by US Magazine. Aside from being a poppin' punk favorite, Alecia is also a fervent activist, not just in the United States, but in the international community as well. In 2005, she contributed to a charity concert raising money for tsunami victims and has often leant her face and her fame to groups like PETA-in late 2006 she was the face for PETA's campaign against the use of mule sing in the Australian wool industry, for which she later apologized, saying that PETA had misled her, giving her inaccurate and incomplete information; and the Human Rights Campaign which, among other things, fights adamantly for Gay Rights in all American states. Alecia Moore has also used her fame to make a shout out against KFC for its treatment of chickens for the slaughter, Prince William's bear-skin headwear and Beyonce's animal fur outfits and jackets. In 2004, Choice USA gave Alecia a big shout out as one of the Top 30 Activists Under 30" for reproductive freedom. Alecia won her first Grammy award in 2001, for her collaborative hit "Lady Marmalade" alongside Christina Aguilera, Mya and L'il Kim. Although Alecia is best known for her chart topping hits and Republican-angering activism, she has also appeared in television commercials for products like Pepsi and has even been noted by magazines like Stuff as one of the Sexiest Women in the World (2002, Alecia Moore was number 36).